Could this be the nicest person of the 2010 season? It’s Greece’s Giorgos Alkaios (he’s the one at the front in the picture), who’s left his Friends at home in order to take on the Eurovision Blog interview…. Introduce yourself to our readers and tell us how you ended up being Greece’s Eurovision representative this year! Hello everyone! My name is Giorgos Alkaios and I have the honour of representing Greece together with my friends in the 55th Eurovision Song Contest. I have been involved in the music industry all my life and music is my passion and my friends. I mean that I share this passion with my friends and all together we are trying to show to Eurovision song contest the other side of the Greek music scene. I am very pleased to have won in our national final, since competition was difficult this year. I was competing against 7 excellent musicians and music groups of my country, we were all friends helping each other for the best result. The fact that I won, made me really excited but I would be also happy to support any other participant if he had got the ticket to Oslo. Who are your Friends? 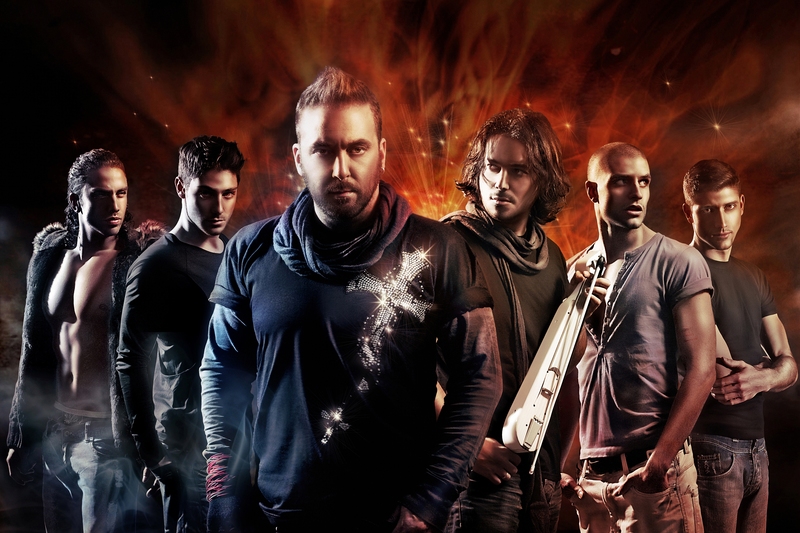 We only know the name of Giorgos Alkaios but who are the other members of the band? My friends who will be on stage with me are the exceptional Pontiac Lyre player and musician Lazos Ioannidis, and the dancers Anastasios Kanaridi, Yevgen Buli, Iakovos Gogua and Petros Zlatkos giving all their energy for a really powerfull choreography. However, there are also my friends with whom we work together in our record company “Friends music factory” and we have written the lyrics of the Greek entry OPA. These friends are Giannis Antoniou, Dionysis Schinas, Kassiani Karagioule, Dimitris Chortarias, Stavros Apostolou, Tolis Schinas and Manos Chortarias. What are you most looking forward to about taking part and what can we expect from your stage show? Which is your favourite all time Eurovision song and your favourite from your home country? I like many songs from Eurovision song contest during the years, but of course I cannot forget Johnny Logan ” What’s another year” and “Hold me now”and Celine Dion for sure! Their songs are just exceptional. As for Greek Participants, we are so close friends with Antique, Helena Paparizou, Sakis Rouvas and Kaiti Garbi that I keep their songs enclosed deep in my heart so as to give me all the energy I need for Oslo.I cannot wait to meet with musicians from all over Europe and make new songs.. my new favorites! Which of the other entries this year do you rate? I like many songs from this year’s Eurovision Song contest, there are many ballads with great voices and some mid tempo songs with great rythm.Those that we have up tempo songs are just few, but we hope all of us to create a wonderful show. Let me see the songs presented on stage, because some audiovisual details might make me change my mind! As you know really well, Eurovision is music, sound and show all in one, so everything plays its important role to the whole presentation. Many Eurovision fans have said it isn’t a great year for songs, what do you think about this? I have listened to all entries and I believe that this years Eurovision is a year of ballads and midtempo. I like very much listening to the music of my colleagues coming all over Europe and I believe that the songs are very good on the whole. They might not be very up tempo, but that doesn’t mean they lack in quality. Music has its own language and inspires each person in a different way. We can never say we have good or bad songs as this is totally relevant to each one’s personal taste.I personally believe we have great voices this year! A lot of websites are tipping Greece for their second victory with your song. Do you have a strategy in mind to bring the contest back to Greece? That would be just great! It is really good to hear from most people so good things on our work. Together with my friends we are trying to bring to the Eurovision Song Contest the other side of the Greek music scene. OPA has the unique quality of passing energy to the people,and as a greek expression of celebration, hapiness and good mood, is an effort for all to let bygones be bygones and start all over again. Therfore I would say that this my ‘strategy’ for the ESC in Oslo and along with a big smile and discipline we hope for the best. The UK gossip website Popbitch said that Greece were “The only entertaining act so far” in this year’s Eurovision, due to all the ballads that are in the contest this year. What do you think of this statement? OPA is indeed an entertaining and cheerful song, while it serves a purpose: to make people optimistic about the future! As musicians, we have worked with my friends days and nights, we have given our soul for that song this is why we love singing it. I am not a competitive person, I wish all participants to be all together, help each other and exchange ideas. The one who is going to win is the one that will have the chance to live the unique moment of Eurovision ever after. Eurovision always suffers from accusations of political/neighbourly voting. Do you think the new voting system with the re-introduction of juries has gone some way to changing people’s minds? I think that the re-introduction of the juries might be a good strategy to fight against neighbouring voting and in some way it has indeed changes people’s minds. The jury voting does increase the credibility of the ESC and puts forward the true quality of music. However, I am personally not influenced by the voting procedure, this is just typical issues. The thing is that we will live the Eurovision experience and try our best for Greece! I do not think the result. Oslo is only music to me! I have listened to the UK entry and I think it is a very powerful pop song which will be loved by the audience. It brings memories to me from early 90s, hits from Kylie Minogue, Rick Astley…lots of songs. I am sure Greek people will feel the same! Good luck UK and thank you very much. This entry was posted on May 19, 2010 at 7:24 am	and is filed under Eurovision 2010, Eurovision News, Greece, Interviews. You can follow any responses to this entry through the RSS 2.0 feed. You can leave a response, or trackback from your own site. PLEASE!!!! YOY MUST VOTE GREECE TONIGHT BECAUSE IF EUROVISION COME TO GREECE , TOURISTS WILL COME TO GREECE AND THEN ,GREECE WON’T OWE SO MUCH MONEY!!!!!!!!!!!!!!!!!!!!!!!!!!!!!!!!! PLEASE VOTE GREECE TONIGHT!!!!!!!!! we need your vote!!!!!!! !